On Saturday, August 29, Aikido Chuseikan of Tampa Bay will be hosting a one-afternoon Systema workshop with Kenny Gonzalez. 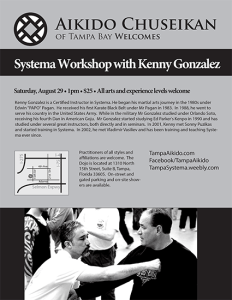 Kenny Gonzalez is a Certified Instructor in Systema. His martial arts background began in the early 1980s, and includes receiving his first black belt under Edwin “PAPO” Pagan. While serving in the United States Army, Mr. Gonzalez was awarded the rank of yondan (4th degree black belt) in American Goju-Ryu Karate under Sensei Orlando Soto. Mr. Gonzalez started studying Ed Parker’s Kenpo in 1990 and has studied under several great instructors, both directly and in seminars. In 2001, Kenny met Sonny Puzikas and started training in Systema. In 2002, he met Vladimir Vasiliev and has been training and teaching Systema ever since.